In the game of football, stars are born yet not all feats can merit stardom. For a budding talent such occasions usually offer the opportunity to write your name in the archives. The young Ghanaian attacker gladly took his chance. Hitherto to this display, another Boateng (Kevin Prince) was the only Ghanaian attacker grabbing the headlines in the elite club leagues. The 10 year difference between the two didn't halt the younger Boateng from taking the center stage. 6 league goals each now. 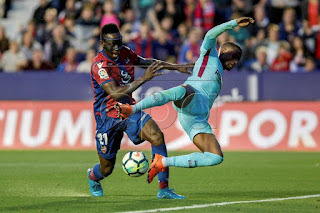 Playing slightly behind last seasons' 22 goal hero for Levante in the La Liga, Roger, Emmanuel managed to keep a calm head thrice to condemn Barcelona to their first defeat in the league this season. The kind of performance a young Messi would have exhibited. In a match fixed for the best, Coutinho got a treble of goals too but Boateng had already done the harm. Well, Emmanuel who also found the back of the net against another league giant, Real Madrid in his maiden season is the first player to score a hat-trick against Barcelona in 13 years. Diego Forlan was the the last player to have done so. The former Charity Stars player joins Micheal Essien, Kevin Prince Boateng and Sule Muntari as the only Ghanaians to have scored against the blaugrana. 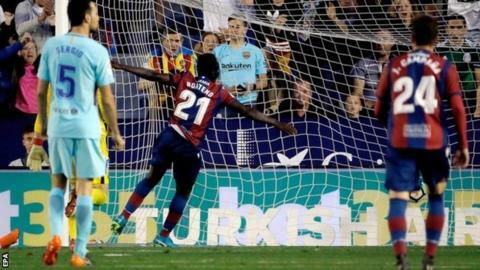 He is the first African to net a hat-trick against the Spanish club giants. Boateng who only joined Rio Ave in 2014 from Charity Stars has represented Ghana at the youth level and is in the good books of Coach Kwasi Appiah to be given a full chance as an international. No side have gone an entire Spanish top flight season unbeaten since the 1930s, when there were only 18 games in a season and Boateng needed only 40 minutes to ensure that. Barcelona had played 44 league games without a loss dating back to last season. 5-4 it ended to less fancied Levante. With Levante having staying in the league in the coming season, Emmanuel has set a mark for himself and he can only get better. Hopefully he wins a silverware like he did at Moreirense.